Because of their sheer weight and the fact that a range of different implements are often attached, agricultural machinery moves along at much slower speeds than cars and trucks. In order to ensure the safety of those who drive agricultural machinery, along with car and truck drivers who utilise the same roads, each Australian state has a set of guidelines that regulates how, when and where the machinery is to be used. The guidelines also aim to ensure that agricultural machinery is only to be used on roads if it meets the relevant safety standards. Farmers are subsequently required to apply for the appropriate permits, most of which can be obtained from local police stations, before they even begin to consider using their agricultural machinery on roads. These permits typically last one year and conditions vary depending on the size, type and condition of the agricultural machinery in question. Obviously, if agricultural machinery and the implements that are typically attached to it are in poor condition they will be deemed unfit for use on roads and will not be eligible for a permit, so it is recommended that the appropriate improvements are made to machinery prior to applying for one. John Berends Implements offers a range of durable, high quality implements for use with agricultural machinery, and they can help to ensure your agricultural machinery acquires the relevant permits each year. This is because in essence, if implements used with the machinery are of poor quality, the chances of receiving the permit will diminish dramatically. The company offers a range of slashers for small to medium tractors, as well as those for heavy duty use. The heavy duty slashers have a one piece body made from high quality, 5mm steel and a 75 HP oil lubricated gearbox. They are designed specifically for Australia’s harsh conditions and are subsequently equipped to cut material efficiently and effectively. When attached to tractors these implements have the potential to greatly enhance productivity as they allow for the transportation of large, bulky products. Available in 4” and 6” sizes, the carryalls are equipped with three point linkage mounts to suit different engine sizes. The range includes bale handlers, bale forks, twins round bale handling forks, silage forks, pallet forks and adjustable feed out forks, among others. 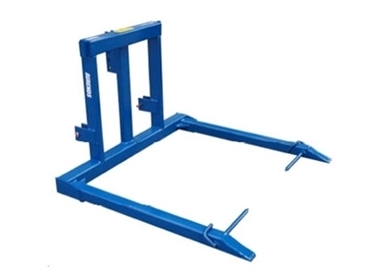 They have a three point linkage fork design; and one to four options are designed with tensile strength for lifting various different weights.